Finding good gluten free bread is tough. Even tougher is finding rolls that taste like normal bread and will hold together as a packed lunch in a rucksack. So many GF breads disintegrate when you pack them up in tin foil. My sturdy roll of choice to date has been the brown millet roll from Findlaters, but they are getting increasingly hard to find. So I decided it was time to put the Wheat Free Bakery Direct to the test. So long as you have a reasonable size freezer, WFBD is a superb option for sourcing gluten free bread. 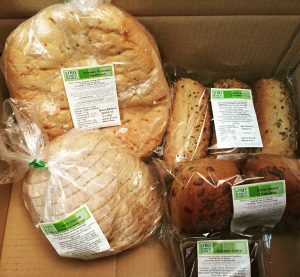 The bakery has online ordering and the delicious products appear at your door in a well packed box. You can collect direct from the bakery with advance booking, but for most people a trip to West Lothian is going to cost the same in petrol as the small delivery charge. I have tried the oat cob, which toasts well and is moist, with no grittiness. I also put the chia seed ciabatta to the rucksack test and it came out well. My gluten-eating walking companion gave it the thumbs up too! Also delicious are the seeded sub rolls and the flavoured flat bread. The little carrot and ginger mini cakes are cute and delicious. They are also trialling doughnuts at the moment. These come well wrapped and then need a microwave and a roll in some sugar. 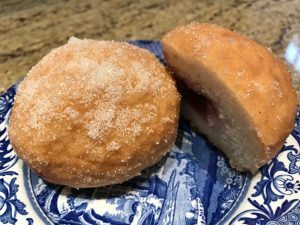 This is a slight hassle but worth it – my first jam doughnut in two years! It is worth ordering your supplies to freeze, if you have the space. Check out the website and definitely try the bread as it is good and the nearest to normal I have tried. You can also buy from the Hopetoun Farm Shop – and the great people at Sugar Daddy’s bakery on Rodney Street gets in an order every Thursday, so you can pick up from there.